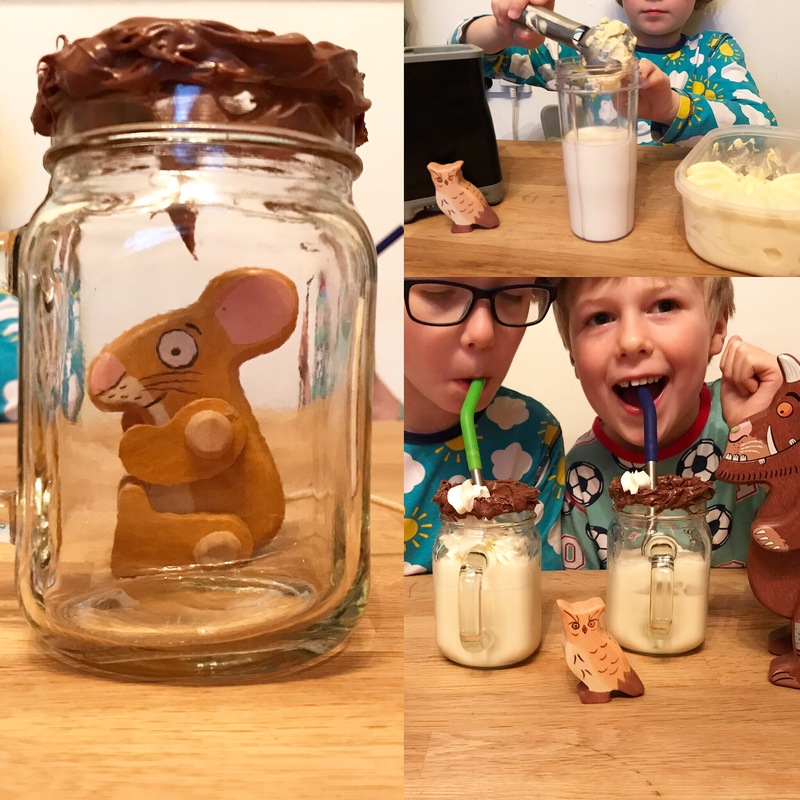 So last weekend with the boys we had some different Gruffalo themed shenanigans! We drew, we painted, we did some spelling on the whiteboard in the kitchen and we also had a Gruffalo feast! Our gorgeous new figures from Babipur were (obviously) the star of the show. Now I’m sure you all know the story by Julia Donaldson. I’m fairly certain I can recite the whole thing from memory, but then I’ve been reading it to the boys for the past 7 years! Spoiler Alert! It’s a beautiful rhyming tale of a devious wee mouse walking through the woods trying to avoid being eaten by a Fox, a Snake, an Owl and ultimately the Gruffalo himself. It’s full of manipulation, blatant lies, cunning and pure fantasy. The perfect children’s story! 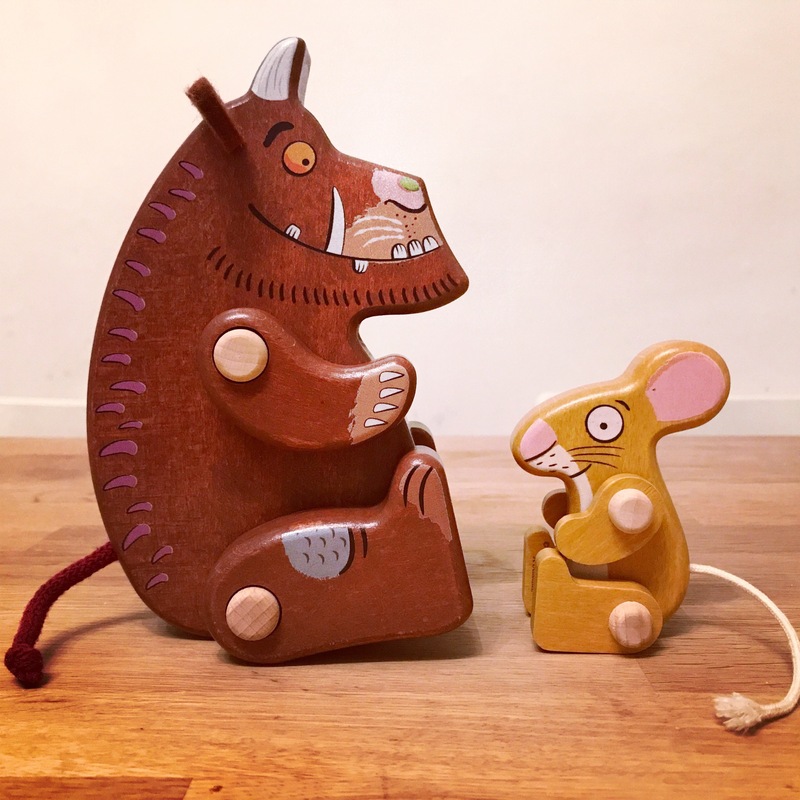 Alongside the Gruffalo and Mouse, we’ve used some of our Holztiger animals available from Babipur. The figures are so beautiful. They are a fab shape and weight. The details are wonderfully painted by hand and extremely tactile. Perfect for story sacks and teaching little ones recognition. So here goes…The Mouse starts off looking for a nut. Oren made sure he found some! Then the Mouse encounters a snake in the woods. 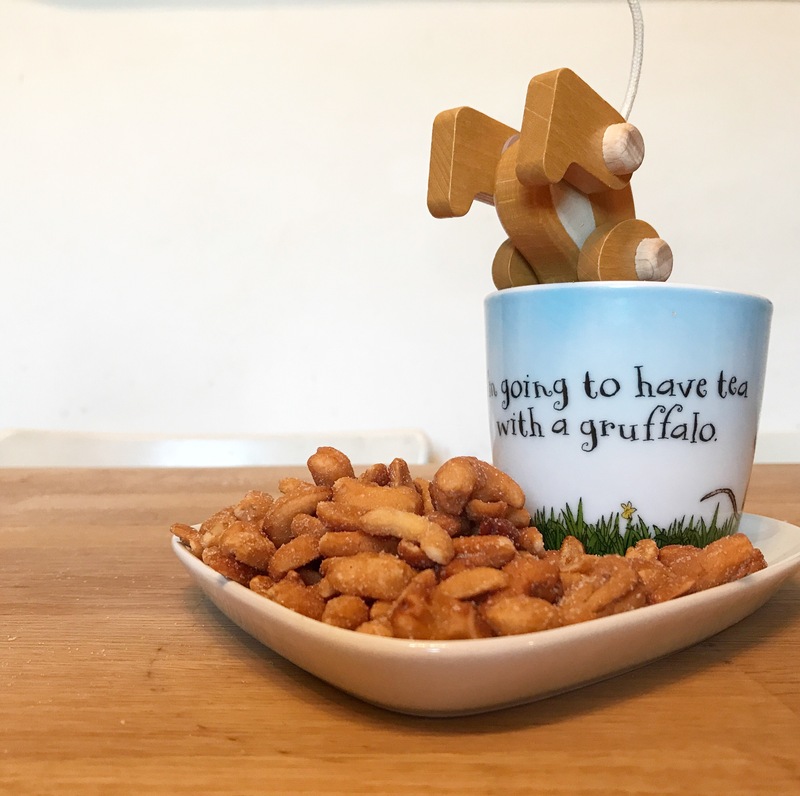 To avoid being eaten he claims that he’s “off to have tea with a Gruffalo”. 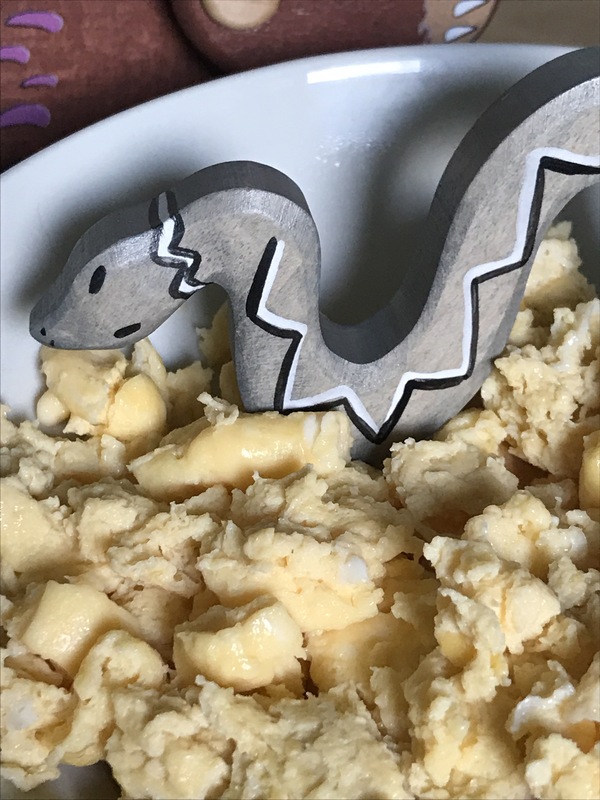 After tricking the snake he suggests that the Gruffalo’s favourite food is scrambled snake. 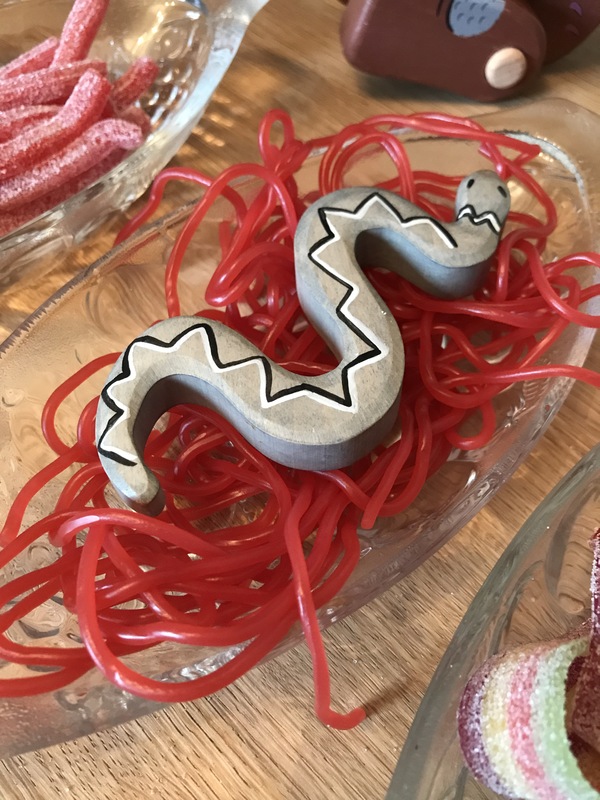 The snake slithers off in fear. Now we couldn’t agree on what to do here. Edward was rooting for scrambled eggs, Oren wanted sweets. It was lunchtime, so we did both. Another daunder in the woods leads the Mouse right into the path of a fox. Again, with a cheeky bit of cunning the Fox is convinced that the Gruffalo’s favourite meal is roasted fox and scarpers. We did sweet potato wedges and carrots. 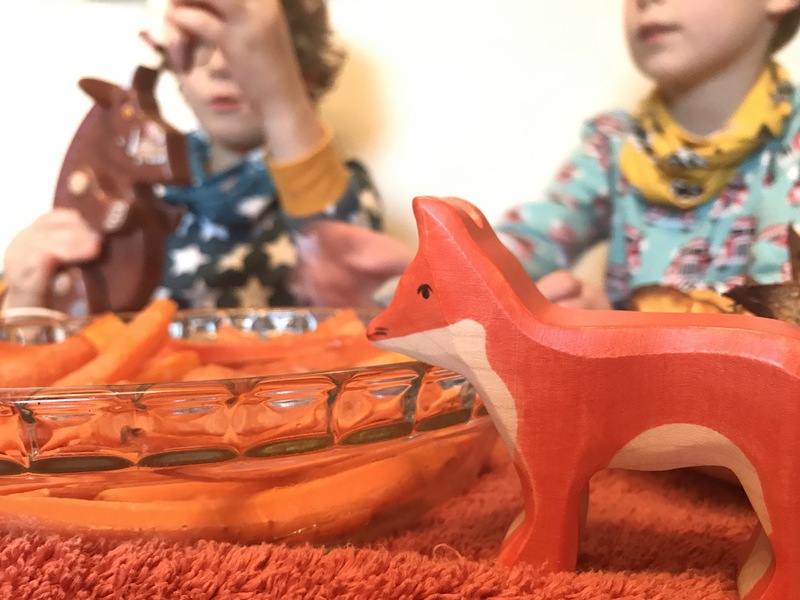 We also pretended to roast the fox in the fire but having 3 and an open fire was slightly more chaotic than I first thought and I couldn’t get a picture! 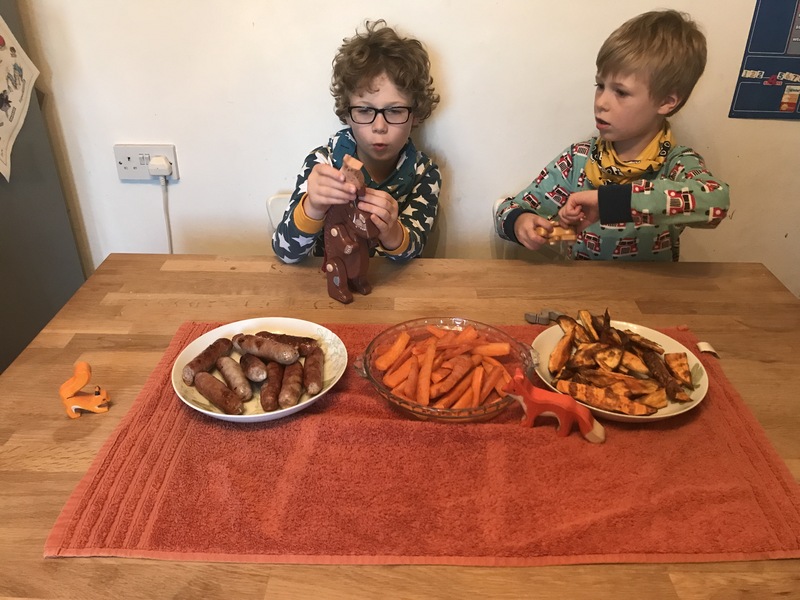 We had sausages, which Edward said could be a “log pile house” and while we waited for it to cool down the boys stacked all the creatures to see who could get the highest. Hilarity ensued when the tower fell and the dog ran off with the Owl! We went with Owl Ice Cream milkshakes, another fab use of our Klean Kanteen Straws too! 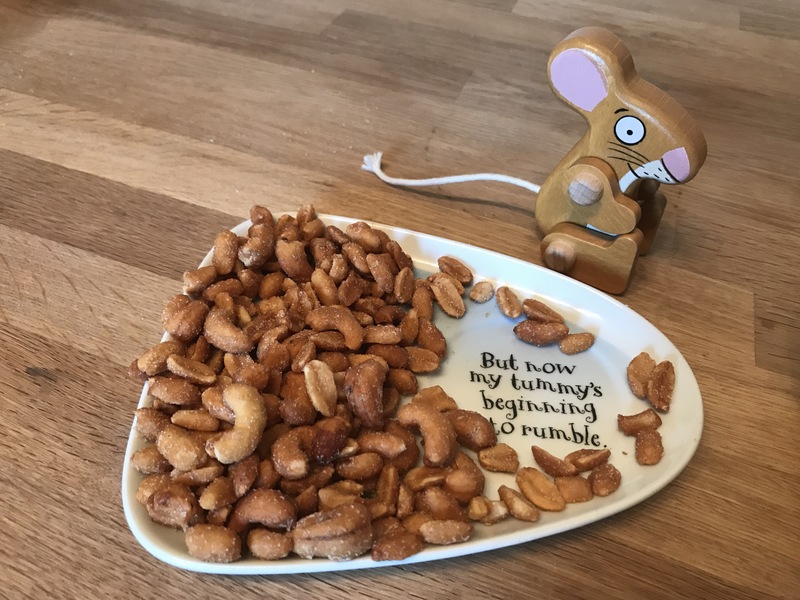 Finally the Mouse meets the Gruffalo and spins a deceitful tale that it is in fact he who is the scariest creature in the forest and that he quite fancies Gruffalo Crumble! So did we! Edward is trying to get his hobby badge at Beavers and has spent the past few weekends picking different recipes and baking. 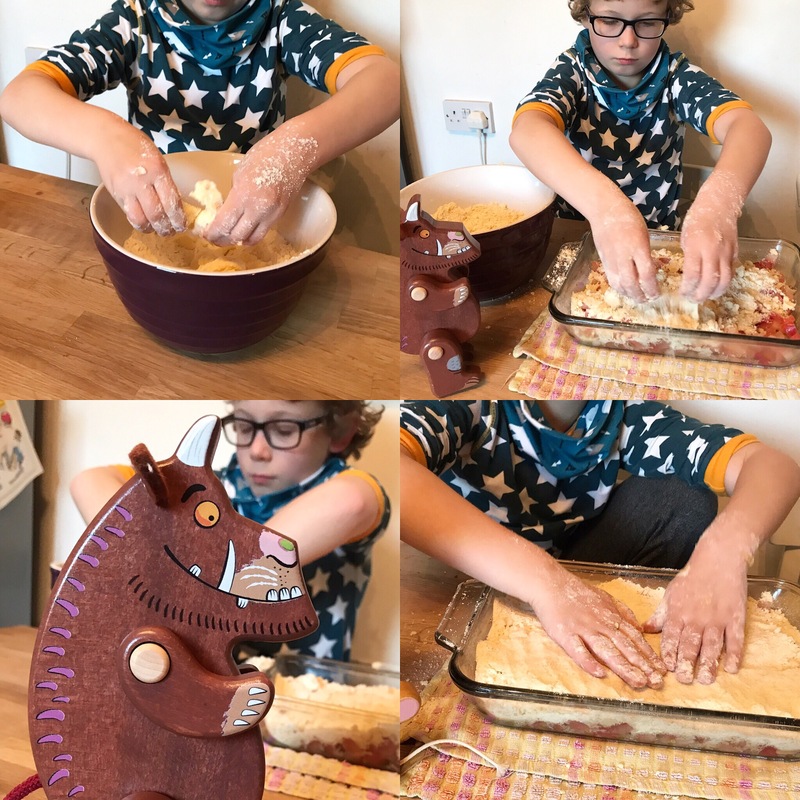 This weekend he wanted to make a Gruffalo Crumble. While Lochryn napped, Daddy and Oren went off to the allotment/orchard for apples and Edward prepped the crumble topping. The Gruffalo Crumble made a gorgeous end to a weekend of themed foodie delights. All 3 were involved throughout and we all had full bellies come Sunday night! The Gruffalo story and figures will be loved in our house for years to come! Get yours here. The code BUDDY will get you 10% off! Next Muff Fluff – Why I’ll never go back to disposable sanitary pads! Wow, this is really creative I love it! It was so much fun! Thinking of doing Loki’s birthday as a Gruffalo theme now! That’d be awesome, if you had the space you could always turn your house or garden in to the woods and do a trail/treasure hunt 😜 Definitely need more excuses for milkshakes! Love the idea of a trail/hunt – definitely one to keep in mind!